If a socket wrench isn't powerful enough, an air impact wrench might be the way to go. These pneumatic tools that we review below pack sufficient torque to enable you to deal with the most stubborn lug nuts and toughest bolts. Air impact wrenches commonly feature ergonomic handles, which are great to absorb some of the high torque impact whenever you are loosening or tightening fasteners. 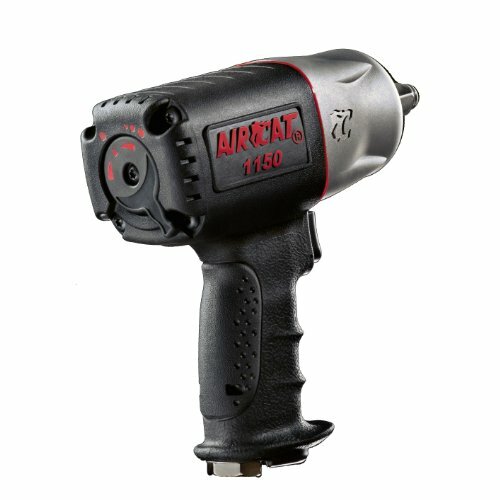 The 4.5 lb, Aircat 1150 Killer Impact Wrench is the best-received air impact wrench we have examined. It packs 1,295 feet-pounds of loosening torque, and 1,400 blows per minute, all warranted for 2 years. Users reported that it is great for general use, has a working torque between 200 and 950 ft-lb, is pretty lightweight and quiet, and is considerably powerful. Some mechanics describe using it to disassemble tractor transmissions. which included axle bolts, mounts and wheel lugs- saying that it was incredibly powerful with a highly sensitive trigger, accomplishing the work quickly and quietly. ​That said, let's take a look at five of the best selling air impact wrenches on the market today and see how they compare. The 90 psi, 8000 rpm Ingersoll-Tand 231C Air Impact Wrench is an expensive but quality option that has a TwinHammer Plus impact mechanism. Its users are satisfied that it is great at rotating at 425 ft-lb torque and 600 ft-lb reverse torque, but also note that some parts of the 231C ½ inch Super Duty Air Impact Wrench is prone to breakage. These are some of its product specifications: contoured handle, pressure-feed lubrication (for greasing), two-piece construction that is easy to service and an adjustable power regulator. This contoured handle is a comfortable option when operating if you are looking for a heavy-duty Ingersoll-Rand Air Impact Wrench. Users feel that it is great at first use because it is fully lubricated straight from the package. The Ingersoll-Tand 231C Wrench has power settings suitable for any wrench work and it is truly sturdy built for heavy duty use. Users pointed out that the 231C Air Impact Wrench is strong, powerful, good performing and long-lasting. However, some parts of the air compact wrench is prone to breakage like the trigger, metallic ring holding the socket and the speed adjuster. As for the trigger, nonetheless, proper lubrication can fix the problem. In conclusion, it is designed for heavy work with an air consumption of 4.2 cfm but one should not crank up its psi to more than 100. The 3.9 cfm, 7000 rpm ACDelco ANI405 Impact Wrench Pneumatic Tool is a solid option that has a 500 ft-lb of torque with ½ inch drive. Its users like that it is great at doing what it’s supposed to do at a cheap price tag, but also note that it is made in Taiwan. The ACDelco Impact Wrench (500 ft-lbs Twin Hammer) has an innovative impact mechanism, has 4 speeds (3 forward and 1 reverse), a handle exhaust design and is encased in an aluminium alloy. 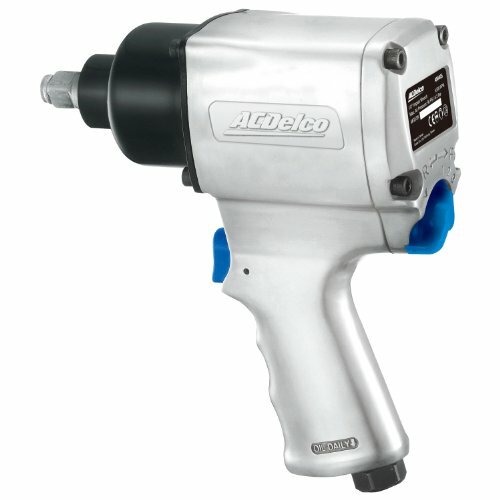 This metal alloy casing is a sturdy option if you are looking for an inexpensive but durable ACDelco Impact Wrench. What users like about this product is that it is compact but it is powerful enough to do any kind of handiwork that requires lug nut drilling. The impact sockets are also easy to detach and attach. One user suggested that the ANI405 ½-inch Impact Wrench is a beginner’s power tool for someone’s starter’s elbow-grease collection. What users dislike about this wrench are the construct of the trigger and its heaviness (because of the aluminium alloy). Because of this, some users caution prospective buyers about being prone to wrist fatigue. In conclusion, this might be a first time mechanic’s best friend because of its durability and price, but it is slow compared to other wrenches. 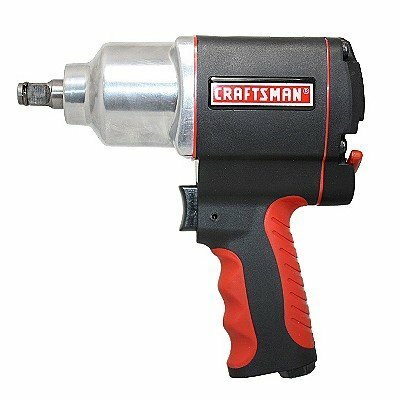 The 4.2-pound, 7400 rpm Craftsman 9-16882 Impact Wrench is a pretty cheap option that has a single hammer. Its users like that it is great at handling 150 psi compressors, but also note that the torque power isn’t enough. It can run at 400 ft-lbs torque, has economic trigger, has contoured grip (two moulded) and has an internal silencing. 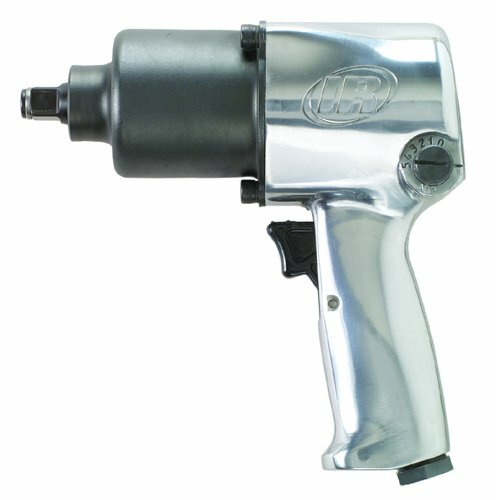 This internal silencing is a safe option if you are looking for a quiet Craftsman Impact Wrench. 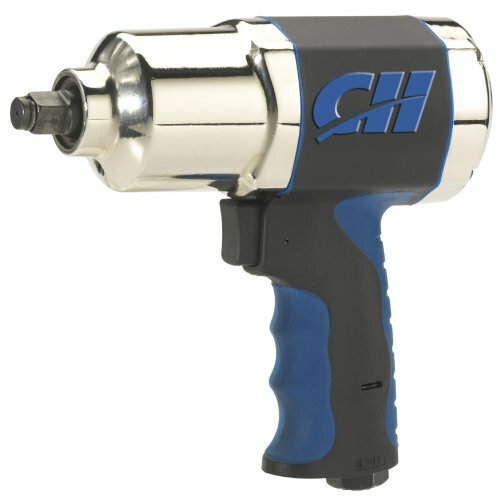 Users commented that it is an even cheaper alternative to other air impact wrenches and but it looks and feels expensive. It has an inlet size of ¼ inches and a hose size of 3/8 inches. It runs on 120 volts powered by a lithium battery and has a volumetric flow of 5.2 cfm. Some users say that it works great and the Craftsman 9-16882 ½ inch Impact Wrench gets delivered on time. However, many users feel that its torque is not that powerful compared to other impact wrenches. It is only suitable for light use and is not for your professional mechanic. A user suggested that it should come with a larger pneumatic tank for better performance. Overall, the 9-16882 Impact Wrench is a durable alternative with a 90-psi to boot, but it is only suited for easy-to-attach-and-detach lug nuts. The 5.1 scfm, 8500 rpm Campbell TL140200AV Impact Wrench is a solid option that has 450 ft-lbs max torque. Its users think that it is great for automotive repairs and maintenance, but also note that some buyers reported that their unit doesn’t work. The Campbell Hausfeld Impact Wrench has 3 installation settings, easily adjustable torque regulator, and a soft comfort grip. This soft comfort grip is a viable option if you are looking for an affordable but comfy Campbell Wrench Gun. Most users point out that for its reasonable price, it works well. It is a lightweight air impact gun that does the job easily and quickly. The TL140200AV Impact Gun can even remove 150 ft-lbs of tight nuts. It can also be used by old people without issues. However, others say that it is a weak product and loud for their tastes. Users experience that very tight nuts and bolts can’t be loosened by the Hausfeld TL140200AV Impact Wrench and would require a breaker bar. Others commented that they should use a more powerful air compressor for it to be efficient. Overall, this product is backed with a 1-year limited warranty but most of the time it stops working beyond the warranty period. The 4.5-pound, 9000 rpm AIRCA 1150 Impact Wrench is a great option that runs at 1,400 blows per minute. Its users think that it is great at being utilized for professional use, but also note that it is recently made in Taiwan. Here are some of its product features: variable speed settings, aluminium finish, 15% larger rotor (for unmatched power), patented aircat handle, and patented silencing technology exhaust system at 86 dB. This quiet exhaust mechanism is a well-suited option if you are looking for a quiet but very powerful ½ inch Impact Wrench. Most users feel that is it well performing and very powerful for a silent impact gun. Although it has an aluminium body, it feels lightweight and friendly to the wrist. The 1150 Killer Torque Impact Wrench works well even on lower psi compressors. It is a solid choice for budget conscious professional mechanics. Some say that it is an excellent gun equalling the best performing air wrenches on the market. The AIRCAT 1150 can even loosen stubborn crank bolts on a Honda with ease. However, it has a pressure sensitive trigger than sometimes acts up. Some users also report that it is wobbly as it vibrates when switching to higher speed settings. Overall, the AIRCAT 1150 ½-Inch Wrench Gun is a 1295-ft-lb, 4.3 cfm that comes with a 2-year labor and parts warranty, although when it had been made in Taiwan, the torque was reduced at only 900 ft-lb. Air impact wrenches typically feature single hammer mechanisms that deliver a high degree use of max torque, all of it packed in a portable and ergonomically designed package with a contour grip and sensitive trigger. 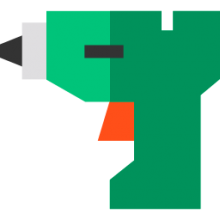 Many contractors, mechanics and other home repair specialists recommend adding a cordless impact wrench to your toolbox, particularly because it works so well with low-volume air compressors. One individual who enjoys practicing basic automotive maintenance writes that rotating tires was an incredibly smooth job. He was happy that his impact wrench was solidly designed, small-sized inside of a solid metal housing, though sometimes the weight balance felt a little off because it was top-heavy, in the case of the ACDelco pneumatic wrench. If you're looking to purchase an air impact wrench, check out our comparison table above, read our reviews, and make sure to check in on the individual product pages of the wrench you are looking to purchase to see what other users are saying about it.